Platoon Laser is the perfect activity for your next Birthday party, Stag or Hen do, Team Building Event, or simply a friendly gathering. Anyone aged 7 or over can take part in our exciting range of missions, with exclusive hire of our Battle Arena from as little as 1 hour, up to a full day of laser fun! Up to 20 player Battles – Your group of up to 20 players will have exclusive use of the Battle Arena for either one hour, one and a half hours, or two hours, and will compete in two teams over a range of exciting missions. 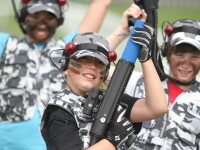 Tournament Formats – The perfect format for Team Building, Platoon Laser Tournaments offer Battles for 3, 4 or 5 teams of up to 10 players per team. 3 Team Battle: Choose between either a 1 hour or a 2 hour battle. Suitable for up to 30 players. 4 Team Battle: Choose between either a 2 hour or a 4 hour battle. Suitable for up to 40 players. 5 Team Battle: Choose between either a 3.5 hour or a 7 hour battle. Suitable for up to 50 players. More than 50 players?? No problem! We can provide a bespoke specialised Exclusive Battle Day for you – please call us on 033 033 27872 to discuss your event. All Tournament Formats include exclusive hire of the Battle Arena, and all necessary play equipment. As part of the Daytona Milton Keynes complex, we have a full professional kitchen in-house, providing freshly prepared home cooked food every day. Choose from our popular café menu, or pre-book something special from our Exclusive Menu range – bespoke menus available on request.